To Cite: Aghaghazvini L, Aghaghazvini S. Intraosseous Pleomorphic Adenoma of the Mandible, Iran J Radiol. 2014 ; 12(1):e6921. doi: 10.5812/iranjradiol.6921. Salivary gland tumors consist of about 3% of all head and neck tumors. Benign tumors (mainly pleomorphic adenoma) are the most common type. About 80% of them occur in the parotid glands. Carcinomas are rare and more common in the smaller salivary glands (1, 2). Benign salivary gland tumors rarely develop in the jaw bones. They arise from either the ectopic salivary tissue or minor salivary glands that are implanted in the bones. Ex pleomorphic adenomas within the mandible are extremely rare and only a few cases have been reported to date (3, 4). We present a rare case of intraosseous pleomorphic adenoma of the mandible mimicking a radicular cyst or a brown tumor with unusual presentation in a 38-year-old man with low socio-economic status and poor hygiene. He presented with a rapid enlargement of the left mandible bone during two months. He also had mild pain and paresthesis of the mental region. On physical examination, a bony non-tender mass lesion about 20 × 15 mm in size was detected in the left para-symphysial portion of the mandible. Multiple teeth caries and destruction were detected. On the orthopenthogram, there was a lobulated irregular border lytic lesion in the left parasymphyseal portion of the mandibular body with erosion of the overlying teeth roots. In addition, there were many other destructed and caried teeth together with destruction of a few lamina duras. Regarding imaging findings, large radicular cyst with periapical abscess was the first diagnosis. Brown tumor related to hyperparathyroidism and also other odontogenic cysts were our differential diagnoses. The patient underwent surgery. A rubbery white-gray mass, 15 × 10 × 10 mm in size, was resected and sent for pathology. Pathology reported an infiltrative neoplasm exposed of epithelium with bland looking nuclei and acidophilic cytoplasm in a fibromyxoid stroma without necrosis. Pleomorphic adenoma was the diagnosis. There was no tumor recurrence during the one-year postoperative follow-up. 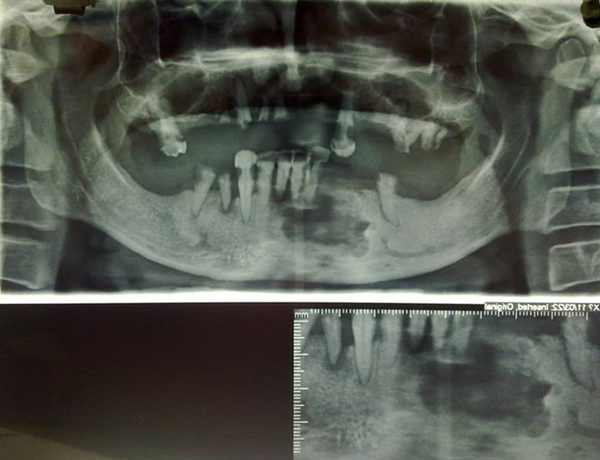 This is an interesting case not only for rarity but also for the sudden onset presentation of the lesion and unusual diagnosis in underlying jaw and dental disease (Figure 1). Figure 1. A 38-year-old man with rapid enlargement of the left mandible. A lobulated lytic bony lesion with a partially sclerotic border in the left parasymphyseal portion of the mandiblular alveolar ridge accompanied with destruction of the overlying teeth roots and lamina duras. There is a notable lack of a few other teeth with caries of the remaining in the maxilla and mandible.